Today’s control system designers face an ever-increasing “need for speed” and accuracy in their system measurements and computations. New design approaches using microcontrollers and DSP are emerging, and designers must understand these new approaches, the tools available, and how best to apply them. 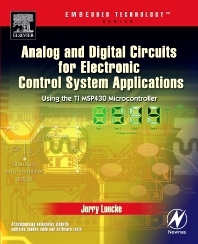 This practical text covers the latest techniques in microcontroller-based control system design, making use of the popular MSP430 microcontroller from Texas Instruments. Written by an experienced microcontroller engineer and textbook author, the book is lavishly illustrated and includes numerous specific circuit design examples, including a fully tested and documented hands-on project using the MSP430 that makes use of the principles described. For students, engineers, technicians, and hobbyists, this practical text provides the answers you need to design modern control systems quickly and easily. Electronics engineering technology students. New embedded engineers, experienced engineers moving to microcontroller system design, hobbyists. Signal Paths for Analog to Digital; Signal Paths for Digital to Analog; Sensors; Signal Conditioning; ADCs and DACs; Digital Signal Processing; Examples of Assembly Language Programming; Data Transmissions; System Power and Control; Microcontroller Application Project.